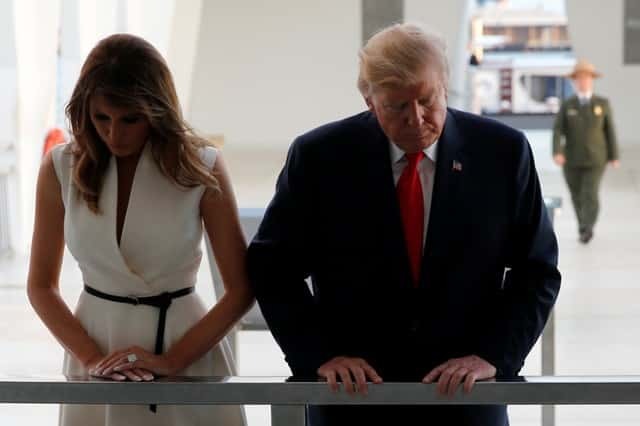 President Donald Trump arrived in Hawaii on Friday as he set out on the longest trip to Asia by an American president in more than a quarter century, looking for help to pressure North Korea to stand down from a nuclear crisis. Later, he was to visit Pearl Harbor and the USS Arizona memorial for the U.S. sailors killed when Japan bombed the American naval base on Dec. 7, 1941. Trump’s 12-day trip to Japan, South Korea, China, Vietnam and the Philippines, ending on Nov. 14, takes him out of Washington at a time when he has been beset by several issues. These include an intensifying federal investigation into Russian meddling in last year’s election, New York’s recovery from an attack earlier this week that killed eight people, and debate over a Republican tax-cut plan that if approved by Congress would be Trump’s first major legislative victory. The trip began just days after Trump’s former campaign manager Paul Manafort was indicted in the investigation into Russian meddling in the 2016 presidential election and after his attorney general, Jeff Sessions, faced Democratic calls to appear before Congress again to clarify his previous testimony about the campaign’s Russia contacts. Amid the furor caused by the revelations, the Kremlin said on Friday that a meeting between Trump and Russian President Vladimir Putin at an Asian economic summit next week was being discussed, and Trump said it might happen. Court documents made public on Monday also disclosed that a Trump campaign foreign policy adviser, George Papadopoulos, pleaded guilty early last month to lying to the Federal Bureau of Investigation. The documents cited a March 2016 meeting, when Trump was campaigning for the presidency, and attended by Trump and Sessions, in which Papadopoulos offered to help arrange a meeting between Trump and Putin. While Trump tweeted about developments vigorously this week, he told The New York Times on Wednesday that he was “not angry at anybody” about the case and there was nothing to suggest any collusion by his campaign and Russia. Trump’s plan for an extended absence from Washington has alarmed allies who, after seeing a healthcare reform bid fizzle, worry the tax effort could suffer without Trump to keep momentum going. On Saturday, Trump is to fly to Japan and later visit South Korea in search of a united front against North Korea before going to Beijing, where he will push Chinese President Xi Jinping to get tougher with Pyongyang. In the Fox interview, Trump was asked if he planned to be tough on China over thorny issues including trade, intellectual property theft and subsidies. Trump said Chinese President Xi Jinping “has been pretty terrific” in cutting Pyongyang off from banking and oil systems. He added that Japan had reason to be worried about North Korea and alluded to Japanese Prime Minister Shinzo Abe’s campaign for a military buildup against that threat. Trump will attend the Asia-Pacific Economic Cooperation summit in Danang, Vietnam, make a state visit to Hanoi and end his trip with the Association of South East Asia Nations summit in Manila. Trump told reporters before leaving on Friday that he would spend an extra day in the Philippines.